One of Deb's new Wacky Whiskers. 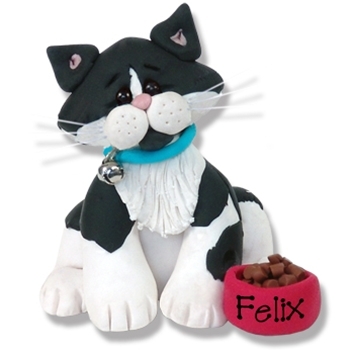 Many of you already know Felix as our little mascot kitty. Felix is a true celebrity and one of Deb & Glenn's six rescue kitties. Felix is a Black and white rag doll. Of the six rescue kitties, Felix is definitely the craziest! His nick name is Crazy Felix. Felix may be easily personalized with a name on his food dish. Handmade from polymer clay and designed by Debi Allison. She is packaged in her own little clear acrylic box with a cute background that may also be personalized.